Do you remember the first time you got a massage? What stood out most to you? Chances are you remember more about the interpersonal experience than the massage itself. The atmosphere of an office, as well as the practitioner’s disposition, can make or break the aspect of relaxation for someone, and it’s essential massage therapists know how to properly welcome someone to their space–whether it’s their first time receiving massage or not. Clients may have any number of takeaways from the experience of visiting you for massage, and these may or may not have to do with your bodywork technique. One person may remember how difficult it was to park, while another might be distracted by your shoes when they’re staring through the face cradle. Of course, as a practitioner you have more control over some things than others, but doing everything in your power to optimize elements you can control will still make a difference. Visitors learn a great deal about you and your practice simply from how you personalize your environment. First and foremost, your office should facilitate sanitation and client safety. While ensuring proper hygiene practices and sanitizing surfaces and linens after each use, avoid creating a space that feels sterile. Stiff chairs and stark white walls can make clients uncomfortable, so add a relaxing color scheme and plush cushions that promote relaxation. 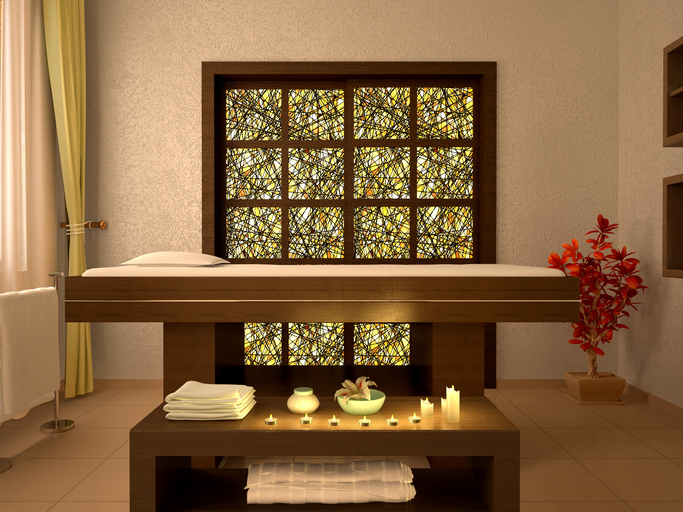 When possible, use soft, natural light and dimmer switches on any lights in the treatment room. Promote air flow through the office with proper ventilation and a comfortable temperature–about 72-75 degrees Fahrenheit. If your space will allow it, designate a separate area for handling business transactions. Making payments and discussing money can make some people feel uneasy, so it’s best to remove these procedures from the bodywork space. A massage therapist with excellent customer service skills will not just make an impression on their clients–they will also allow their clients to make an impression on them. Learn a client’s health history and the concerns that brought them in, but also pay attention to the client’s stories. Being able to greet someone by name and remember something about their life goes a long way in forging a solid therapeutic relationship. Some people may love the lavender mist you spritz around your treatment room and the peppermint lotion you use on their feet. Others won’t be as keen on it. In addition to learning any allergies or skin sensitivities to products you use, let people know your go-to items and give them some selections. Have clients choose the music that plays during their treatment or the oils they want in a bath, for example. Though to many clients such elements will hardly be the focal point of the massage, most will appreciate this consideration and be glad for the opportunity to state their preferences. It should go without saying, but always use a client’s health history and any current health conditions to inform your work. Focus on the client’s areas of concern at their personal comfort level, and stay present throughout the session to actively measure how the treatment is being received. There is no “autopilot” mode in bodywork. Giving your full attention conveys you take your work seriously and that your clients’ needs are your priority. For regular clients who are otherwise healthy, aftercare may simply mean providing tea or water and light conversation after a service. Simple, small gestures like these can help prolong the relaxing effects of a bodywork session. Clients experiencing acute or ongoing physical health issues may benefit from more support, such as at-home treatment recommendations. You might suggest an ice pack for someone’s shoulder, for example, or some light stretches for another person’s hip. Again, this attention to personalizing the experience for each client earns you trust and authority in your work. Bodywork is about so much more than an exchange of services and payment, and the therapeutic relationship should support the healing benefits of treatments. Making someone feel comfortable doesn’t just help ensure they will return for more appointments; it also enhances the healing effects of bodywork services. Clients who are unable to relax will likely find it difficult to glean any benefit from the session. It’s in your best interests, as well as your clients’, to make the experience as enjoyable as possible. Beck, M. F. (2011). Theory & practice of therapeutic massage (5th ed. ), 291-295. Clifton Park, NY: Milady. This is exactly the kind of service and environment I woukd be looking for!